MACD is one indicator that can confirm the direction and strength of trends. 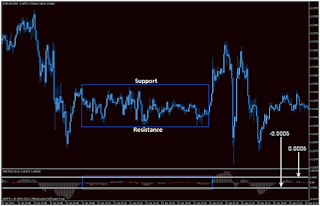 This indicator is also very useful for trading on binary options. Follow the trend is one of the principles adopted by many traders in achieving success. 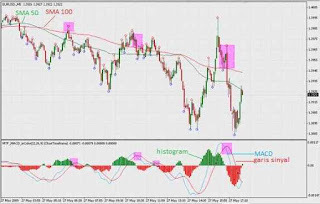 Many opportunities are created from price trends, and following the movement to get the right analysis is one of the many trading methods adopted by traders, both at forex spot and binary options. Although it seems easy, traders sometimes still need to apply a trend trading strategy to help identify, analyze, and place options in accordance with the current trend. In the discussion of trend trading strategies, it has been mentioned about the use of technical analysis and types of trading. One technical indicator that can identify trends, Moving Average (MA), is a device that is highly relied on by trend traders. In addition to recognizing trends, analysis of trend trading strategies also involves a trend confirmation phase. Why is this necessary? In reality, MA alone is not enough to confirm the direction of the trend and know the strength of the movement. Traders need to analyze whether the trend will continue or end soon to be able to put options and expiry time correctly. One indicator that is widely used as a confirmation is the Moving Average Convergence Divergence (MACD) which is often applied together with the MA. MACD is one indicator that can show the direction of the trend and also market momentum. Often included in the oscillator category, traders often use this indicator to confirm the direction and know the strength of a trend. MACD consists of 2 components, namely the signal line and MACD area. MACD is generated from the difference in Exponential Moving Average (EMA) 12 with EMA 26, while the signal line is a Simple Moving Average (SMA) 9 of the MACD value itself. 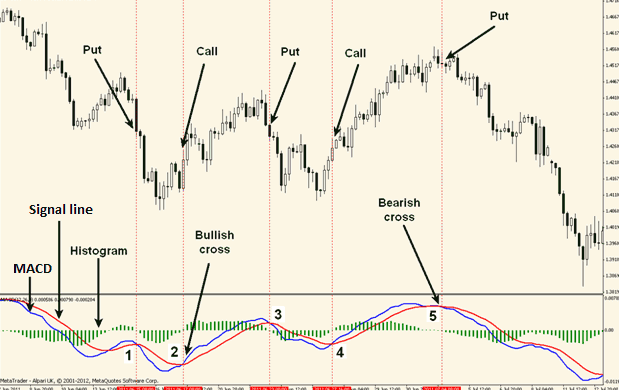 The indicator signal is taken from the MACD area position against the 0. line. If the MACD area is above the 0 line (in the positive zone), then it can be used as a confirmation of the uptrend. Conversely, a downtrend can be confirmed if the MACD is in the negative zone (below the 0 line). The width of the MACD area can be used as a trend strength marker. The wider the MACD area, or the further the MACD bars from line 0, the stronger the current trend is. In addition, traders can also take overbought and oversold signals from MACD. These indications can be analyzed from the intersection of the signal line with the MACD area. Oversold conditions occur if the MACD cuts the signal line from below, while the overbought position is confirmed when the MACD cuts the signal line from the top. In binary options, the trader needs to know the strength of the trend so that he can place the "call" or "put" option more convincingly. In addition, an analysis of the strength of trends is also needed so that traders can estimate the right expiry time. Even though the trader has opened the option according to the direction of the trend, the position can still end out-of-the-money if the option closes when the price trend changes. To prevent this happening, confirmation of direction and strength of trends with MACD needs to be done. Simply put, a trader can pay attention to the momentum of the MACD crossing with a signal line to open an option in the direction of the trend. In the graph above, it appears that if the "put" option is opened based on the MACD indication that cuts the signal line from above in numbers (1), (3), and (5), the position will end in-the-money. The option "call" option also appears in the indication numbers (2) and (4), where the MACD is seen cutting the signal line from the bottom. 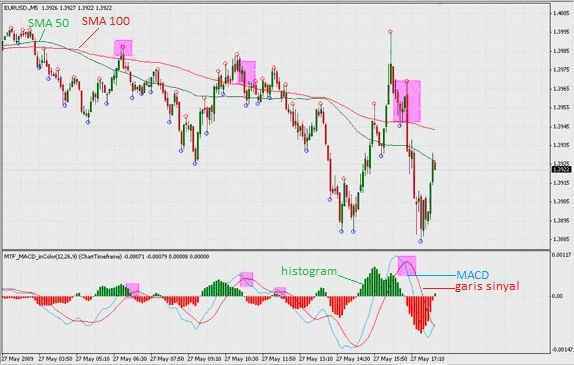 Some binary options trading strategies that apply the use of MACD also involve several types of trend indicators such as 2 types of MA namely SMA and EMA. Besides that, MACD can also be used in trading boundary in binary options. In accordance with its function, MACD acts as a confirmation of the description of trends that have been identified on the chart by other indicators. In this case, traders can use SMA, EMA, or Parabolic SAR as the main trend indicators. The strategy was designed by James Ayetemimowa, and has been widely re-published on various binary options sites. The time frame used in the chart is 5 minutes. Traders can use any time frame because this strategy is not limited to a 5 minute time frame. It appears that on the harge chart, there are 2 SMA lines that are installed with periods of 50 and 100. A bullish trend is identified when SMA 50 (green line) is above 100 SMA (red line). The opposite is true for bearish trends. The price movement above shows a downtrend which is indicated by the position of the 50 SMA below the 100 SMA. For entry in the right position, traders can pay attention to the MACD intersection with the signal line, or the price position corrected above the MA lines. Overbought points marked with the pink area above can be used as an effective "put" signal. 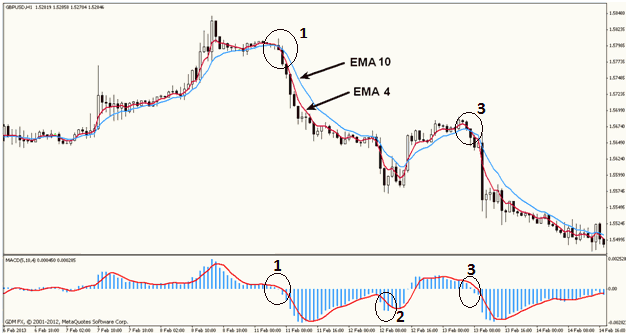 In the use of EMA, the option signal is taken from the EMA cross which is confirmed by the MACD move from the positive to the negative area or vice versa. The example above shows the use of 7 EMA and 26 EMA, an indication of the option "call" appears when EMA 7 cuts EMA 26 from the bottom up. At the same time, MACD moves to leave the negative zone and then moves above level 0. This time, the EMA used is EMA 4 and EMA 10. Downtrend the price confirmed when the EMA 4 cuts the EMA 10 from above and the MACD area moves to the negative zone (1). However, when the MACD cuts the signal line from below (2), the "call" signal that appears is not very convincing because the price does not show a trend change and is still below the EMA. The option signal appears again (put) when EMA 4 cuts the EMA 10 from the upward direction again, and MACD again shifts to the negative zone (3). Traders who want another setup can add RSI or other types of oscillators to complete confirmation of the entry option signal. In addition, traders can also adjust their own use of MACD with the trading system that has been implemented. In addition to confirming trends, MACD can also be used to recognize prices that are sideways. This condition can help traders to be able to place options with boundary trading. To give a range or limit that indicates sideways movement, traders need to add 0.0005 and -0.0005 levels to the MACD indicator. 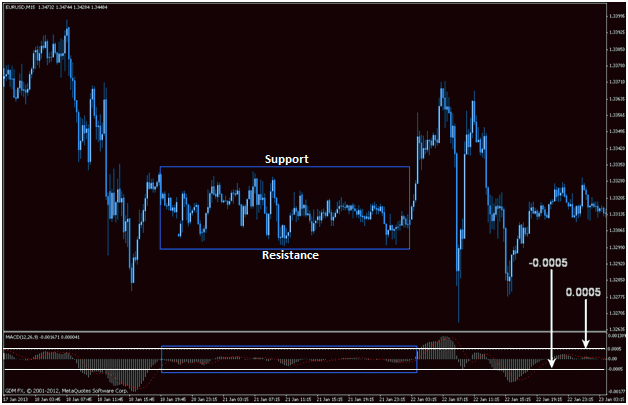 After sideways are identified from the MACD area, where movement is limited in that range, traders can look for support and resistance from current price movements. Boundary trading can be done in accordance with the broker's price range and price support-resistance. Option "in" can be chosen if the range harge broker is not further than support and resistance. Conversely, the "out" option can be chosen if the broker's price range turns out to be outside the limits of support and resistance. At brokers that do not determine the price range, traders can easily set the top and bottom ranges according to support and resistance and then choose the "in" option. While if you are still unsure if the price will survive in this range when expiry time is up, you can choose the "out" option with the same range setting. Aside from boundary trading, the use of MACD that is fitted with this range can also be applied to trading breakouts. If the MACD moves out the range below -0.0005, traders can take the breakout signal by opening the "put" option. On the other hand, MACD breakout from the upper range of 0.0005 can be utilized by placing the "call" option. Of course, the type of trading used here is high / low. After knowing how to enter options with the MACD techniques above, the binary options trader then needs to determine the right expiry time so that the option can end in-the-money. There is no standard rule in developing exit strategies here, because expiry time is generally determined according to the trading period and the time frame used. Because MACD can be applied to any time frame, the expiry time adjustment can be matched with the trading period only. Expiry time that is set 3 times greater than the time frame is considered to limit the duration of the option with the most proportional time. For example, at a 15 minute time frame, expiry time can be set at 45 minutes. However, this is not always absolutely applicable to each option. If in the process the price shows a less promising movement, traders can still use the broker's facility to add (rollover) or speed up (early closure) expiry time. Both of these facilities should be used with more precise calculations, because improper usage will risk limiting profits and increasing trading commissions. 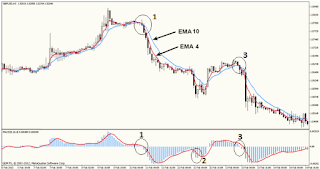 0 Response to "Using MACD for Binary Options Trading"